Margo Cilker writes songs that philosophize hard work, heartbreak, and wanderlust with the reverence of a country music obsessive. She possesses the sharp-eyed clarity of one who has not only found country music, but has lived it. She picks an acoustic like Woody Guthrie at his most fervently righteous. She sings with control and focus, the edge on her voice honed by busking and playing dive bars all over the world. 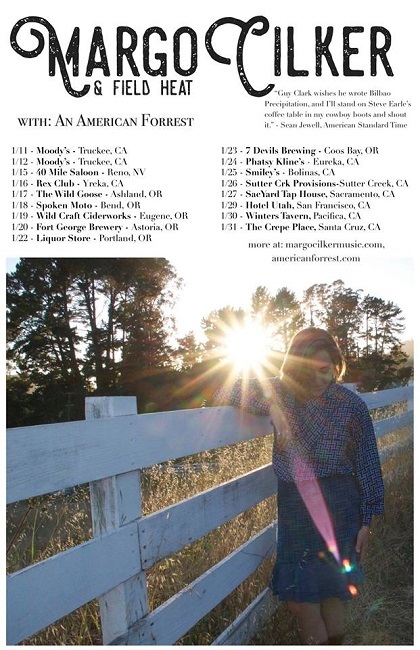 Margo is touring with her band Field Heat, and releasing “California Dogwood” on CD, a special edition collection of her two EPs (California Dogwood / Field Heat).